The cast of ROMEO AND JULIET. Photo by TOMMY THOMPSON. 2006. 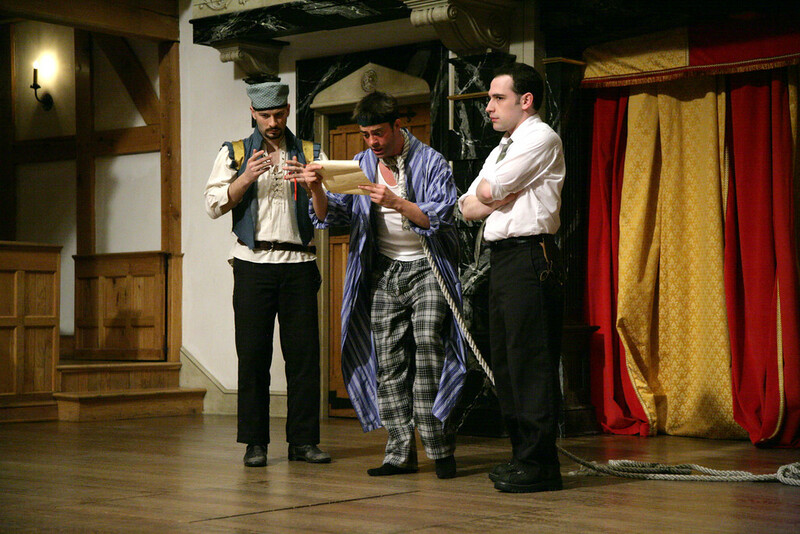 Jeremy West, Matthew Sincell, and Paul Fidalgo in ROMEO AND JULIET. Photo by TOMMY THOMPSON. 2006. 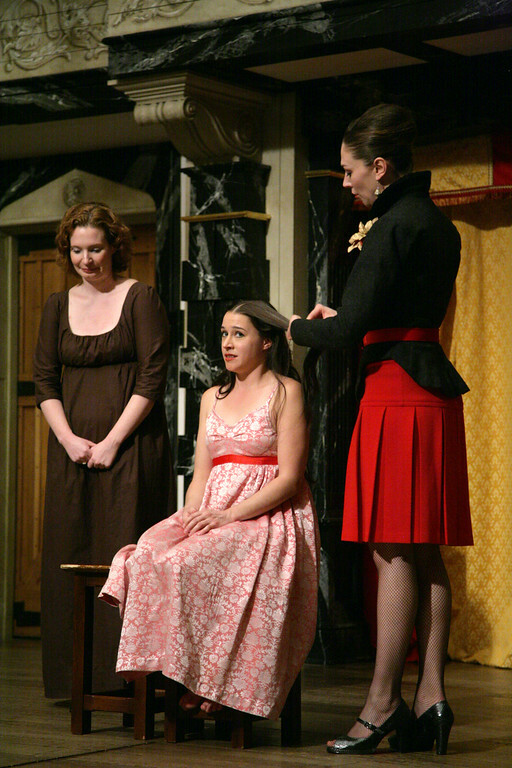 Jessica Dunton, Miriam Donald, and Vanessa Morosco in ROMEO AND JULIET. Photo by TOMMY THOMPSON. 2006. Jessica Dunton in ROMEO AND JULIET. Photo by TOMMY THOMPSON. 2006. 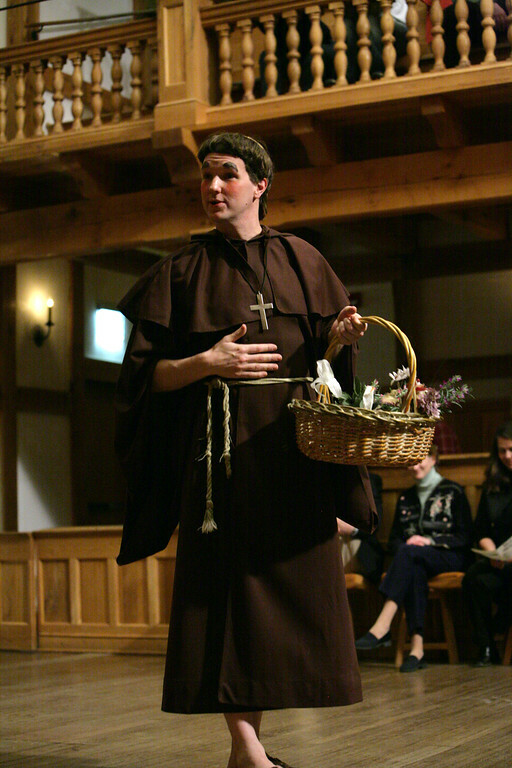 Matthew Sincell in ROMEO AND JULIET. Photo by TOMMY THOMPSON. 2006. 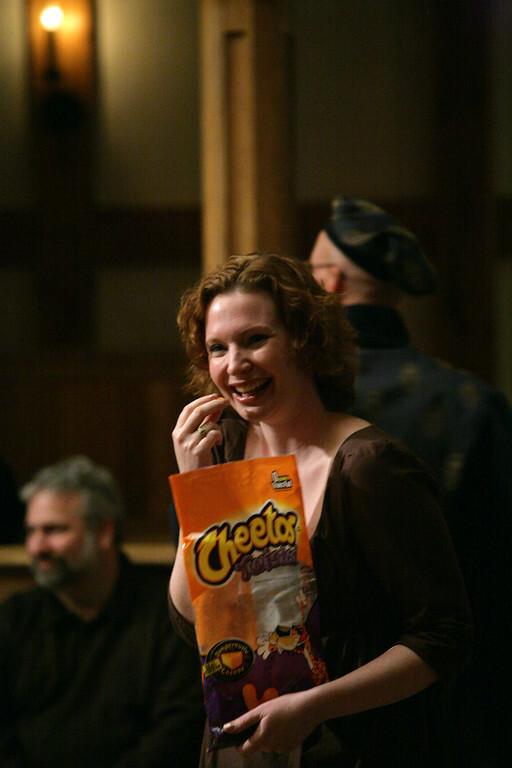 Miriam Donald in ROMEO AND JULIET. Photo by TOMMY THOMPSON. 2006. 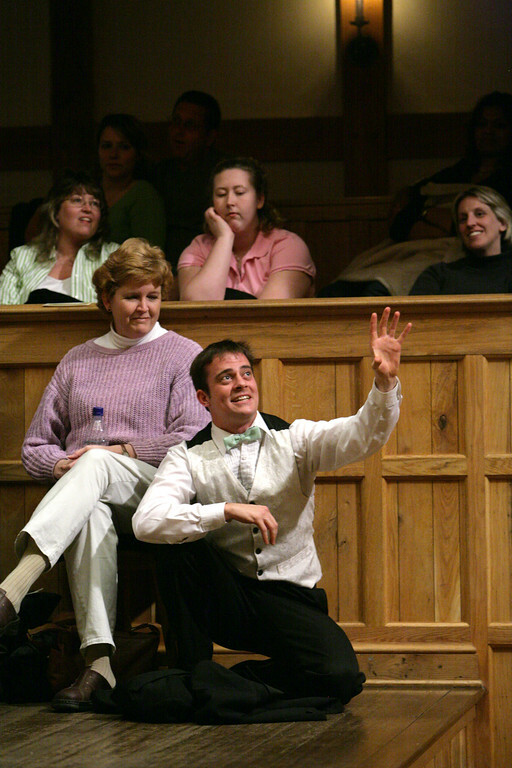 John Harrell in ROMEO AND JULIET. Photo by TOMMY THOMPSON. 2006. Jessica Dunton and Benjamin Curns in ROMEO AND JULIET. Photo by TOMMY THOMPSON. 2006. Miriam Donald and Matthew Sincell in ROMEO AND JULIET. Photo by TOMMY THOMPSON. 2006. Two families (the Capulets and the Montagues) brawl in the city streets of Verona. Mercutio, another kinsman to the Prince and good friend to Romeo, leads Romeo and Benvolio in masks to the Capulet party. Romeo and Juliet is a cultural icon so powerful that our shared concept of the play competes with any production of it that we see. Just hearing the sound of the title is enough to put on a show in our heads: two innocent young lovers, a family feud, a well-meaning friar, a comic nurse, a bull-headed father, an unwanted suitor, and a lot of bad luck. 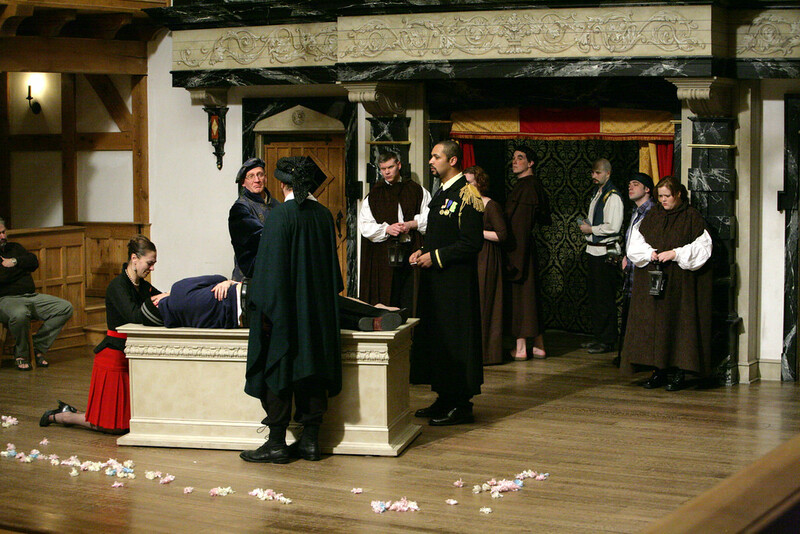 That play is the one that audiences bring with them to any staging or screening of Shakespeare’s script. Is he? When we first meet him, he is obsessed with a girl who is not Juliet; he says he is in love, but his main complain is that even for ready money he can’t seduce her – she will not “ope’ her lap to saint-seducing gold.” Once Romeo meets Juliet, Shakespeare has him quite literally climbing the walls with desire, killing Juliet’s cousin, trying to kill himself, falling down in a tantrum, buying drugs, threatening to kill his servant, actually killing his rival, and then committing suicide about one minute too soon. How lovely is all that? As to the bull-headed father, we first see him declining to approve a marriage for his 13-year-old daughter on the grounds that she is too young. We then see him being a generous and excellent host at his own party. We even see him refusing to let any harm come to the young Montague who has crashed that party. When he does accept Paris’s offer to marry Juliet, he does so not out of greed or dynastic ambition, but because his little girl seems to be so unhappy. And what about Paris, that unwanted suitor? Every word we hear about him is good. He’s young, rich, and handsome. In fact, repeatedly he is described in almost the exact terms as Romeo (both even have the names of fabulous cities). And what is he doing when Romeo kills him? He is visiting the tomb of his beloved Juliet. He has brought her flowers, and he gets into a fight with Romeo because he sees a notorious young man rather suspiciously carrying a crowbar and mattock into her tomb. But the ravishing language of the two lovers and the universal group-think that pre-envisions the play the minute one mentions the title competes with these facts in the script. 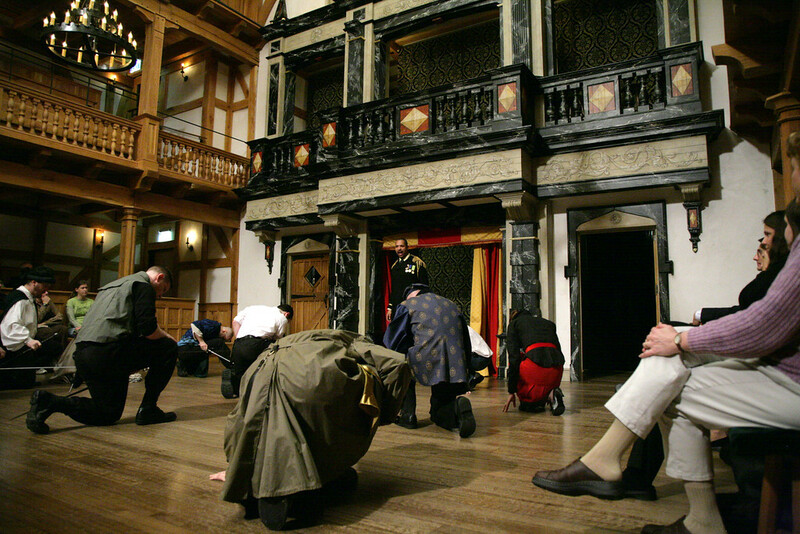 One hope we have for our Actors’ Renaissance Season is that a production prepared by the actors in a rehearsal process more like the one used by Shakespeare’s actors might recover something of the more complex work that Shakespeare wrote.